Wednesday was the first day of spring, although here in England you would think we were still in the depths of winter! Now I’m not one for wishing my life away at all, but I am one for preparing so with spring arriving that only means bikini season is up and coming! In fact June is only 10 weeks away! So if you, like me, are aiming to look fit and toned in your bikini this year then if you haven’t already started your body transformation you had better start now!Because if the above imagery is anything to go by, you are already two weeks behind everyone else being able to notice your body changing! Thankfully many people have clocked onto the fact that we will be wanting to up our health and fitness efforts in the coming weeks and the Tone It Up girls are no exception. If you have not heard of Tone It Up before, you need to go and visit their site as they are really motivational! They offer workouts, recipes, regular motivating emails and workout schedules… all for free! This year they have partnered with Self Magazine and have started the Drop 10 Challenge. For the Self Challenge Drop 10 Challenge all you have to do it sign up and you have access to 10 weeks of fun workouts! 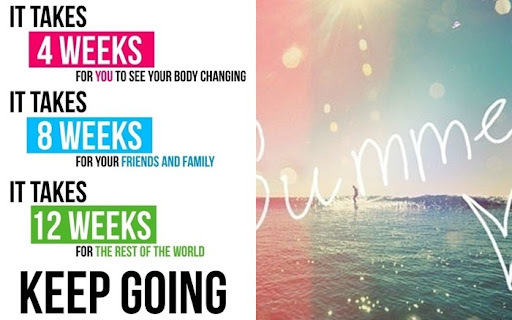 So this means you will become bikini ready in 10 weeks thanks to fitness videos, HIIT workouts, exercise schedules, online tools, daily motivation and tips and recipes and menus! Basically everything you could possibly need. I have signed up for the challenge as I am moving out of home next week so I need to ensure that I keep my diet on track when I’m back picking my own meals and cooking for myself. Plus I really need to increase my toning exercises. I have lost alot of fat thanks to cardio exercise over the past three months, but need to get some definition in on my arms, stomach and bum! So hope by this challenge will help me achieve that. So far this week I have completed a couple of strength exercises and know I am out of practice! I did the workout below with a medium sized weight which I used to lift with ease, and couldn’t move my arms properly the next day! Its a great short strength workout, that says it works all areas that you need to target, however I felt it most in my arms and bum! Give it a go! Have you started your fitness and health regime in preparation for your bikini body? If not, are you going to start now? Do you fancy the Drop 10 Challenge, if so let me know! So inspirational! Thanks for sharing. I just came across your blog and I'm your newest follower 🙂 Would you mind checking out our blog and (if you like) following back via GFC and Bloglovin'? We also have a giveaway going on right now! xxBlog: sixthtractate.blogspot.comEnter our current Giveaway! Be sure to live with the color a few days before making your decision. A modern, Asian styled room may have deep rich colored woods, stream lined furniture, and clean, crisp colors. Research the Artist – Look for other works by the same artist on the web, by typing in the artist’s name, and the word “artist” after it.